The implantation of medical devices is not without risks. Bacterial or fungal infections can occur and the body’s strong immune response may lead to the rejection of the implant. Researchers at Unit 1121 “Biomaterials and Bio-engineering” (Inserm/Strasbourg university) have succeeded in creating a film with antimicrobial, antifungal and anti-inflammatory properties. It may be used to cover titanium implants (orthopaedic prostheses, pacemakers…) prevent or control post-operative infections. Other frequently used medical devices that cause numerous infectious problems, such as catheters, may also benefit. These results are published in the journal Advanced Healthcare Materials. Implantable medical devices (prosthesis/pacemakers) are an ideal interface for micro-organisms, which can easily colonize their surface. As such, bacterial infection may occur and lead to an inflammatory reaction. This may cause the implant to be rejected. These infections are mainly caused by bacteria such as Staphylococcus aureus, originating in the body, and Pseudomonas aeruginosa. These infections may also be fungal or caused by yeasts. The challenge presented by implanting medical devices in the body is preventing the occurrence of these infections, which lead to an immune response that compromises the success of the implant. Antibiotics are currently used during surgery or to coat certain implants. However, the emergence of multi-resistant bacteria now restricts their effectiveness. It is within this context that researchers at the “Bioengineering and Biomaterials” Unit 1121 (Inserm/Strasbourg University) with four laboratories have developed a biofilm with antimicrobial and anti-inflammatory properties. Researchers have used a combination of two substances: polyarginine (PAR) and hyaluronic acid (HA), to develop and create a film invisible to the naked eye (between 400 and 600 nm thick) that is made of several layers. As arginine is metabolised by immune cells to fight pathogens, it has been used to communicate with the immune system to obtain the desired anti-inflammatory effect. Hyaluronic acid, a natural component of the body, was also chosen for its biocompatibility and inhibiting effect on bacterial growth. The film is also unique due to the fact that it embeds natural antimicrobial peptides, in particular catestatin, to prevent possible infection around the implant. This is an alternative to the antibiotics that are currently used. As well as having a significant antimicrobial role, these peptides are not toxic to the body that they are secreted into. They are capable of killing bacteria by creating holes in their cellular wall and preventing any counter-attack on their side. In this study researchers show that poly(arginine), associated with hyaluronic acid, possesses microbial activity against Staphylococcus aureus (S. aureus) for over 24 hours. “In order to prolong this activity, we have placed a silver-coated precursor before applying the film. Silver is an anti-infectious material currently used on catheters and dressings. This strategy allows us to extend antimicrobial activity in the long term” explains Philippe Lavalle, Research Director at Inserm. The results from numerous tests performed on this new film shows that it reduces inflammation and prevents the most common bacterial and fungal infections. 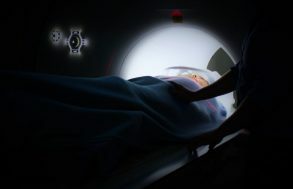 On the one hand, researchers demonstrate, through contact with human blood, that the presence of the film on the implant suppresses the activation of inflammatory markers normally produced by immune cells in response to the implant. 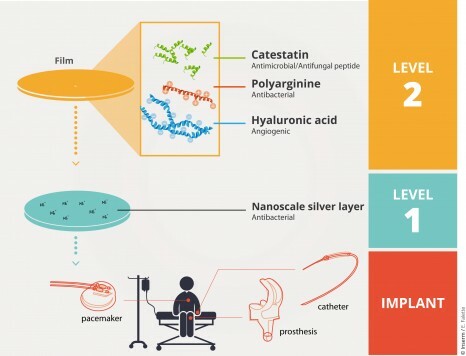 Moreover, “the film inhibits the growth and long-term proliferation of staphylococcal bacteria (Staphylococcus aureus), yeast strains (Candida albicans) or fungi (Aspegillus fumigatus) that frequently cause implant-related infection” emphasises Philippe Lavalle. Researchers conclude that this film may be used in vivo on implants or medical devices within a few years to control the complex microenvironment surrounding implants and to protect the body from infection. This work received the financial support from Institut Carnot MICA and from European Commission with the “Immodgel” project.